Obama signs Patriot Act extension after many liberal Democrats support it. Editor: Congress has voted to extend the highly, controversial Patriot Act and it went quickly to President Obama’s desk for his signature, electronic or otherwise. The cave-in by many liberals and many Democratic politicians to extend this very dangerous act is astounding. The entire San Diego Congressional delegation – except Filner – supported it – even Susan Davis ; Bob Filner didn’t vote. Senator Feinstein and even Senator Barbara Boxer – the “great liberal” – supported it. US President Barack Obama has signed a four-year extension of the Patriot Act from Paris, extending post-September 11 powers allowing the government to secretly search records and conduct roving wiretaps in pursuit of alleged terrorists or their supporters. Hours after the US Senate and House of Representatives passed the law, through votes taken in rapid succession, and just minutes before the law was to expire at midnight in Washington DC, Obama sent in a digital signature, finalizing the renewal on Thursday. During congressional debates, legislators rejected attempts to temper the law enforcement powers to ensure that individual liberties would not be abused. While the government’s actual use of the Patriot Act largely remains secret, members of the Senate Intelligence Committee are unhappy with the extension. “Americans would be alarmed if they knew how this law is being carried out,” added Senator Mark Udall of Colorado, also on the Senate Intelligence Committee. Following the 250-153 evening vote in the house, the legislation to renew three terrorism-fighting authorities headed for the president’s signature with only hours to go before they were set to expire. Congress bumped up against the deadline mainly because of the stubborn resistance from a single senator, Republican freshman Rand Paul, who saw the act’s terrorist-hunting powers as an abuse of privacy rights. Paul held up the final vote for several days while he demanded a chance to change the bill to diminish the government’s ability to monitor individual actions. The bill passed the Senate 72-23. 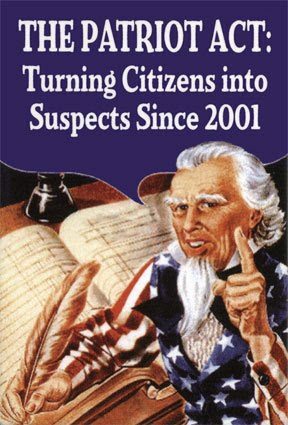 Both of California's senators - Barbara Boxer and Diane Feinstein - voted to extend the Patriot Act. The measure adds four years to the legal life of roving wiretaps, which are authorized for a person rather than a communications line or device; of court-ordered searches of business records; and of surveillance of non-American “lone wolf” suspects without confirmed ties to terrorist groups. It also allows the government to keep track of local library records. The roving wiretaps and access to business records are small parts of the USA Patriot Act enacted after the September 11 attacks in 2001. Unlike most of the act, which is permanent law, those provisions must be periodically renewed because of concerns that they could be used to violate privacy rights. The same applies to the “lone wolf” provision, which was part of a 2004 intelligence law. Since the act was signed into law during the Bush presidency, activist groups around the country have accused the government of taking advantage of the law to stifle non-violent political organizations. During congressional debates this month, Texas congresswoman Sheila Jackson Lee, underlined her opposition to the Patriot Act with the example of FBI raids and grand jury subpoenas against 23 Palestine and Colombia solidarity activists’ homes in late 2010. The raids, legalized through the Patriot Act, were based on alleged material support for terrorism, apparently following claims that the activists were funding the Popular Front for the Liberation of Palestine (PFLP) and the Revolutionary Armed Forces of Colombia (FARC), both designated terrorist organizations by the US. According to statements by two activists whose homes had been raided, submitted to Congress by Lee, allegations of supporting terrorists were bogus, and served as an excuse to invade privacy and stifle political opposition. “We watched as the bedrooms of our two sons were each searched for an hour by three agents wearing blue latex gloves. The agents read one son’s poetry; they sorted through the other son’s t-shirt collection,” said the statement. Last week, another early morning FBI and SWAT raid targeted the home of a Los Angeles activist, Carlos Montes, who woke to the sound of a battering ram breaking down his front door. That raid, also approved under Patriot Act exception, alleged that Montes was supporting officially designated terrorist organizations, a claim the long-time activist rebukes. While those activists, supported by Lee as well as the American Civil Liberties Union and other rights groups, argue that the Patriot Act allows for inappropriate abuse of invasive powers, the law’s supporters have been able to strengthen their position in past weeks since the killing of Osama bin Laden. “The invaluable terror-fighting tools under the Patriot Act have kept us safe for nearly a decade, and Americans today should be relieved and reassured to know that these programs will continue,” said senate Republican leader Mitch McConnell. As it’s been observed, America’s political spectrum stops in the center – there is no left; the Patriot Act supporters is the evidence. Good! We need to stop voting and supporting things based on party affiliation. Let’s do what’s right and in this case, I agree with Obama… YAY!!!!!! Are the faithful faithless? The Patriot Act is the equivelant of ‘it safe yet’. Ask yourself, is the Patriot Act an expression of confidence? Does it enhance the values enshrined in the Constitution and the Declaration of Independence? And if not now a decade later, when? Young people in Spain are protesting – against democracy. Are we doing the same? “Is it safe yet?” from the Marathon Man. Can you be more specific? Do you agree with Obama when he re-signed the Patriot Act… or when he opposed the Patriot Act when Bush signed it? I am confused if you mean you agree with Obama when he opposed it during the Bush Administration or when he signed it under his own Administration………..
That’s awesome that regardless of party affiliation, our leadesr care about keeping this country safe… Way to go Obama! PS- I think party lines is exactly this nation’s worst enemy. We won’t agree and/or support each other (many times) all because of what we call ourselves. Soooooo stupid!!! Sorry, I screwed up when we first posted this article, by mixing up the Pauls. We had posted a photo of Ron Paul, but it was his son, Rand, who was the ‘solitary senator’. The President delegating a machine to be a proxy for his presence is unconstitutional. Breaching the specific steps defined by the constitution for implementing law sets precedence for further breaches until presidential authorization can be bypassed. 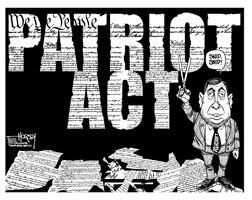 With these “Patriot Act” extensions unconstitutionally “authorized”, Rule of Law no longer carries meaning. Law is authorized by the President affixing his signature, a signature that is unique from each other authentic signature made by the President, and which can be distinguished from an autograph machine’s facsimile. When the President’s priorities take him from the duty of Law Making, the Filibuster or other Congressional method has proven effective. The constitution was written with full knowledge of human limitation. I’m appalled but not surprised. We as American’s have become so complacent and lazy, which is why our Civil Rights and Constitution continue to be depleted. No one wants to take action but everyone wants to complain…like mindless drones! We need to insist that all action taking methods contain a share button so when we have a topic, issue or a bill that we support or oppose we can reach out to our Social Networks and ask for their support. This is the greatest form of gathering large groups of people to support or protest current issues. Lord knows we can’t assemble or protest anymore without fear of imprisonment, which is a direct violation of our rights. So while the Patriot Act is an abomination, we as American’s need to do more and take more action and since most of us are so lazy we can’t pick up a phone, write a letter or do “ANYTHING” to oppose something as atrocious as the Patriot Act, we need to make reaching out for support as easy as possible. Please reach out to your social networks for support in current issues. Hey, we’re the ones, “We the People,” who just bend over and let them do it to us. Kind of defeats the purpose of what our country is supposed to be about. But it could change tomorrow if we got our tired butts in action and simply said “Stop!” loud enough to be heard (no breath holding here, though). Newer Article: Medical Marijuana for the Uninitiated – HELP!